Our mini electronics all-in-one box for LoTHR (so people in LoTHR don’t have to walk all the way to TESLA for the quick and small stuff), got an upgrade. 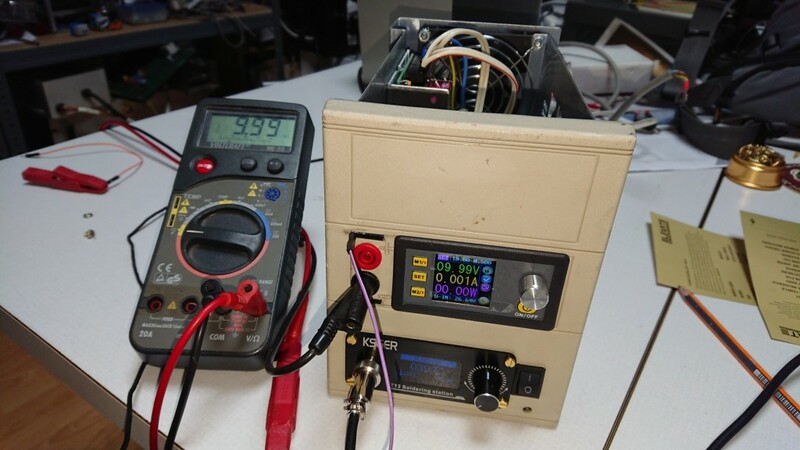 The tiny cut-out on the top left of the load, features a mini-USB jack where we put an USB serial-TTL converter connected to the GND,TX,RX pins of the load. Using the easy command-set you can indeed periodically poll your batteries discharge rate, voltage on so on. But even without USB, the thing is pretty nifty and allows you to set a limit on the amount of mAh to draw, or to stop after a specified time, and so on. As you might know, quite a while ago, our electronics lab TESLA moved to the second flat “W2″. There is a lot more space and equipment for electronic hackery now, BUT. We found that sometimes it would be nice to have some basic soldering capability in our main lounge “LoTHR” as well. 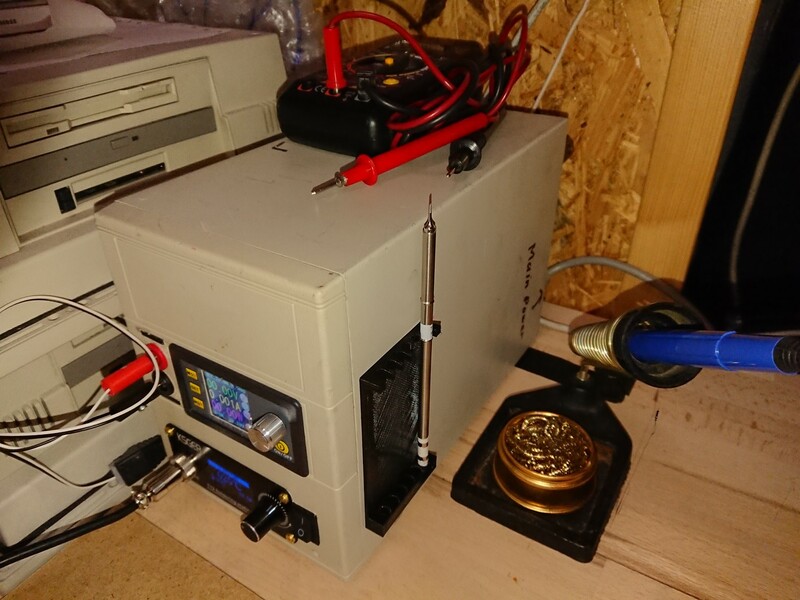 Fret no more, with our new workbench (Work in Progress) we also set up a a micro electronics area. Note that it is not meant to replace TESLA. 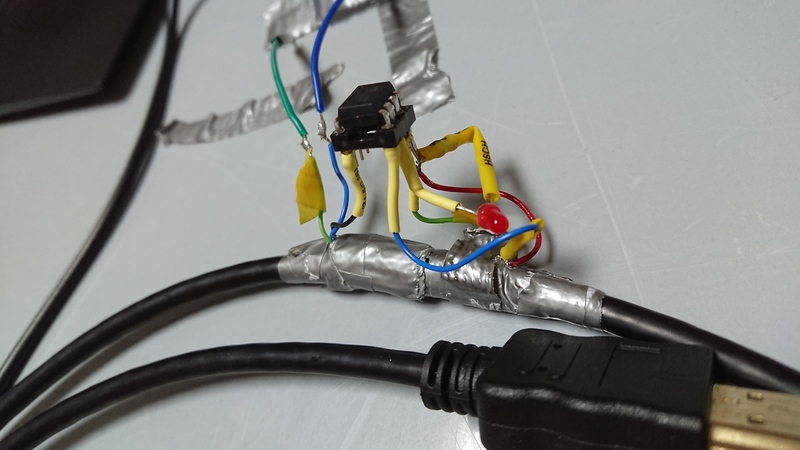 Just to keep you from moving your project all the way to ‘W2″ if all you need to do is solder two wires or check one voltage. 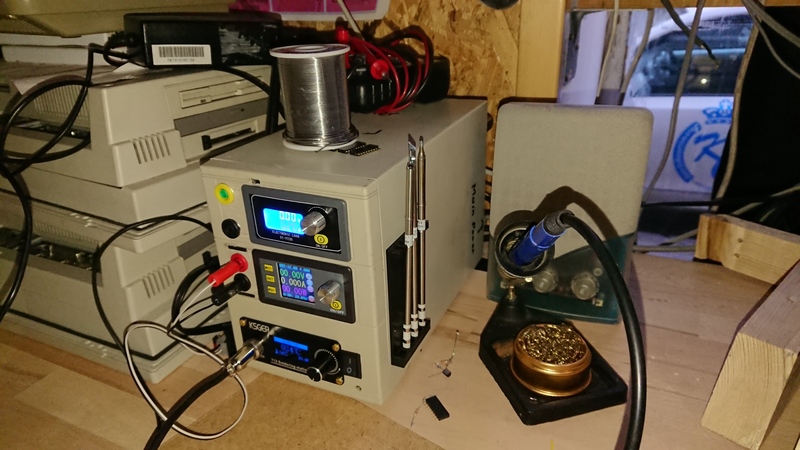 Basically I got us a DPS3005 constant current / constant voltage power supply and a small KSGER soldering station and connected them to a 27V 3.5A power supply. Then, as per Ernst’s suggestion, we put everything into a nice and sturdy box which formally housed external SCSI HDDs. The front-panel was laser-cut so all the equipment would fit and voila, after a few hours putting everything together, here we are. As a finishing touch, a T12-soldering-tip-holder was printed and taped to the side. Further documentation can be found in our Wiki and more photos in our Gallery. As a hackerspace we regularly host user-groups and irregularly host talks and workshops and all of them need to use our beamer. Quite a downer then, that our beamer’s HDMI and DVI Input stopped working with newer laptop graphic cards. Especially since VGA started having it’s own issues: Dark slides transmitted over our long VGA cable cause the beamer to decide input has disappeared and switch the input off.